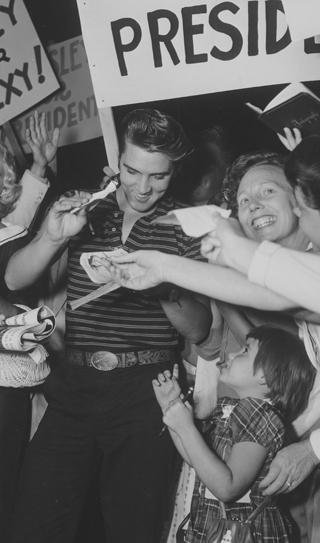 Elvis fan clubs have been around since Elvis first hit the national music scene in the '50s. Colonel Parker's office encouraged fans to form fan groups to honor Elvis and saw their existence as another grassroots opportunity for local promotion. Often times, Colonel Parker and his staff would reach out to local fan clubs to help spread the word about upcoming album releases and performances in their area. Over 50 years later, Elvis Presley Enterprises continues to foster the relationship with Elvis Presley fans clubs old and new, because with their help, Elvis' legacy continues to grow and be passed on to new generations. If you are interested in starting your own Elvis Presley fan club or you already have a fan club but want it to be officially recognized by Elvis Presley Enterprises, email [email protected] and we will send you the forms to register your club.